On the BSM-Stand and within Lower-Saxony’s ‘Schaufenster’-presentation the PiVo-Project is currently made public at this year’s Hannover Fair. At BSM there is not only general information available about the project, but some gear to put hands on. 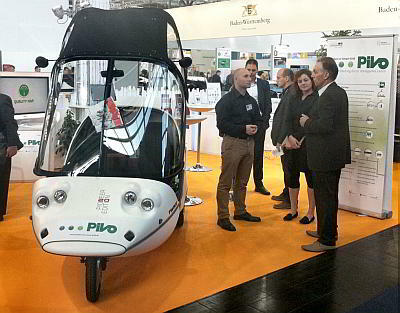 The TWIKE trycyle can be seen the, the vehicle in which the TU Clausthal will test the PiVo-technology first. The BSM-Stand in Hall 27 features as well some actual parts to be modified within the PiVo-Project. Of special interest will be the animation movie produced by project partner Bornemann AG in collaboration with BSM (see screenshot). The project will be presented in the MobiliTec-Forum on April 10th. The complete BSM schedule can be found on the BSM-website. Present in Hanover are the project manager in charge at TU Clausthal, Dirk Turschner, and BSM’s Stefan Kastner and Thomic Ruschmeyer. Next to PiVo a lot of companies and organisations out of BSM’s enviroment came to Hanover. Remarkable is the number of cars on BSM’s stand – from Renault Twizy to Tesla’s Model S all classes of electric cars are present. 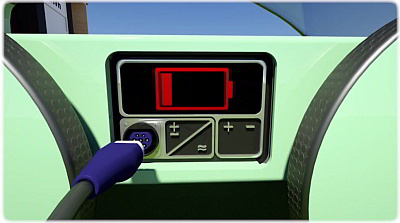 Though no technical novelties there is still there is some attraction to real existing electric vehicles.